Lived c. 1607 – 1665. Pierre de Fermat was one of the greatest mathematicians in history, making highly significant contributions to a wide range of mathematical topics. He was a guiding light in the invention of calculus; he independently co-invented analytic geometry; he invented probability theory in cooperation with Blaise Pascal, and made masterful contributions to number theory. He is best remembered for his last theorem, the proof of which defied the best efforts of mathematicians for over three centuries. Pierre Fermat was born in Beaumont-de-Lomagne, in southern France in late 1607 or early 1608. He was once thought to have been born in 1601, but this was a different Pierre de Fermat – a half-brother who died in infancy. To discuss Pierre Fermat’s early education would be mere speculation, because no records exist. With wealthy, aristocratic parents, young Pierre Fermat probably received an excellent education, and he had a gift for languages; he was fluent in classical Greek, Latin, Italian, Spanish, and Occitan. Starting in 1623 he studied civil law at the University of Orléans, graduating in 1626 when he was only 18. When he was 20, in 1628, his father died, leaving Fermat a very large inheritance. Fermat did not go mad with his new found wealth. He continued working as an attorney and continued with his mathematics. In 1630, when he was 22 or 23 years old, Fermat paid a huge sum of money (over a million dollars in today’s terms) to get a senior legal position in the High Court of Toulouse. This was a job for life. He also became a nobleman. He could now use the aristocratic name Pierre de Fermat rather than simply Pierre Fermat. In June 1631, aged 23, Fermat married his cousin Louise de Long. She was only 15 years old. Another month would pass before she celebrated her sixteenth birthday. The couple had eight children, five of whom survived to adulthood. Fermat was passionate about mathematics and he was a brilliant mathematician. Nevertheless, mathematics was always just a hobby reserved for his spare time. Unlike a modern mathematician, who publishes his or her work at every opportunity, Fermat did not publish his work. Most of what we know about his mathematics comes from his correspondence with other mathematicians or was found in his notes after his death. He worked on mathematics seriously from about 1627 to the 1660s. There was a lull between 1643 and 1654 when a combination of pressure of work, civil war, and plague (which almost killed him) kept him largely out of mathematical action. Fermat’s interest in high-level mathematics first emerged when he was a 19 year-old attorney beginning his legal career in Bordeaux in 1627. There he became firm friends with Etienne d’Espagnet, who had inherited a library of important books including some mathematical works. Fermat was particularly interested in works by Franciscus Vieta, a French mathematician who had made important improvements to algebra. Following his study of Vieta’s work, and of treatises written by Archimedes, the 21 year-old Fermat made his first important contributions to mathematics in 1629, with new methods of finding maxima, minima, and tangents. Marin Mersenne. 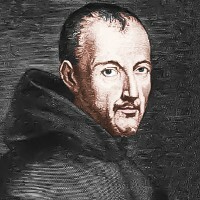 Fermat’s work became known to other mathematicians when Marin Mersenne distributed it to them. In Paris a mathematician by the name of Marin Mersenne had been trying to encourage other mathematicians to communicate more openly. He hoped this would accelerate the development of mathematics. In 1636 he heard about Fermat’s work and wrote to him asking for more details. Fermat replied, and his reply instantly convinced Mersenne he was dealing with a mathematician of the first rank. Fermat knew the works of ancient Greek mathematicians such as Euclid, Diophantus, and Archimedes backwards. Archimedes, the greatest of the Greek mathematicians – and perhaps the greatest ever – had a high opinion of himself as a mathematician, and rightly so. He was far ahead of his time. He was in the habit of teasing other mathematicians, asking them to prove things he had already proven, or sending them answers to questions and asking them if they could see how he had found his answer. In fairness, he eventually sent his friend Eratosthenes The Method in which he described the techniques he used to arrive at his answers. Renaissance mathematicians such as Fermat found themselves looking back to the brilliance of Archimedes’ mathematics. They sought to understand it, and if they were good enough, add to it. Fermat was more than good enough! He developed wonderful new ideas – more of which soon – based on Archimedes’ great work On Spirals. Mersenne in Paris asked Fermat for more details, which he provided – and then, just as Archimedes would have done, he posed further problems and asked whether any of the mathematicians in Paris could solve them. When they could not, in 1638 Fermat sent Mersenne two manuscripts containing some of the new mathematics he had developed. 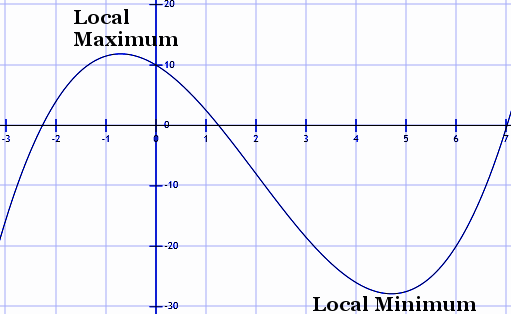 These were Method for determining Maxima and Minima and Tangents for Curved Lines and Introduction to Plane and Solid Loci. He would not always be so generous in providing solutions to questions he posed! In Method for determining Maxima and Minima and Tangents for Curved Lines, inspired by his study of Archimedean spirals and his work on parabolas and hyperbolas, Fermat invented a powerful new method using what we can now recognize as differential calculus. He had actually done much of this work about 10 years earlier, when he was starting out in his legal career in Bordeaux. Fermat found a way to find the maximum points and minimum points of curves. He could also find the tangent to chosen points on a curve, which meant he could find the slope or gradient at points on a curved line. Fermat also found a method of finding the area under power functions, which is the equivalent of applying integral calculus to these functions. Although some people claim Fermat invented calculus, it is fairer to say his calculus methods worked in special cases. He did not provide the general calculus for all curves in the way Isaac Newton and Gottfried von Leibniz did. Newton invented calculus during the 1660s. He found Fermat’s work in Pierre Hérigone’s 1642 six-volume work Courses in Mathematics which included Fermat’s Method for determining Maxima and Minima and Tangents for Curved Lines. It is therefore safe to say Fermat was one of the most significant figures in the invention of calculus. Furthermore, in the second of the works he sent to Mersenne, Introduction to Plane and Solid Loci, Fermat invented the new mathematical field of analytic geometry, showing how an equation from algebra could equally be described as a geometric curve. Another French mathematician, René Descartes invented analytic geometry independently at the same time as Fermat. Fermat worked on mathematics for sheer pleasure. He lived in a time when most people had no use for mathematics. One exception to this was professional gamblers, who needed to have some idea of when it would be in their favor to bet on something. In 1654, Blaise Pascal wrote to Fermat describing gambling problems. 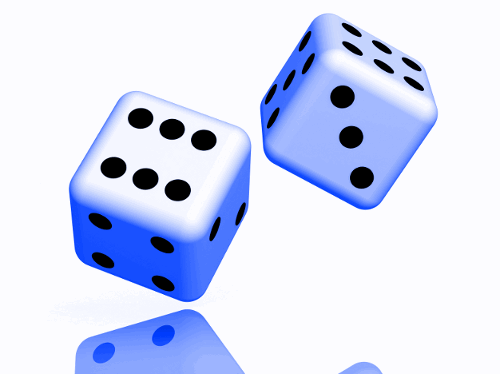 In 1654 Blaise Pascal asked Fermat for help figuring out a gambling problem from a dice game. For example, Pascal had been asked to solve a problem from a dice game: if a player has bet he can throw a 6 within eight throws of a single die, but the game is interrupted after 3 unsuccessful throws, what is the fairest way to share the stake money out? Fermat solved the problems in a mathematically rigorous way by looking at the probabilities of all possible outcomes. Fermat and Pascal are today recognized as the co-founders of probability theory. 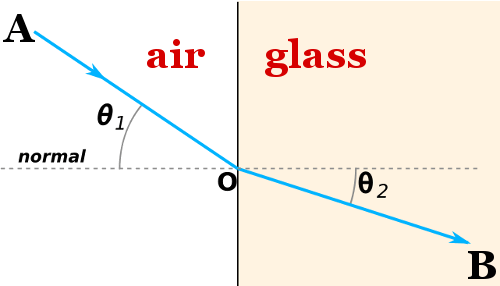 Fermat was able to derive Snell’s Law of Refraction by assuming that light passes between two points in the least possible time. This is not the same as saying light takes the shortest path between two points, because it doesn’t. When it refracts, light changes direction. Fermat established the principle behind the change of light’s direction is that it takes the least possible time to make its journey. Light changes direction when it moves into an optically denser medium. Light travels more slowly in denser media. By changing direction, the light ray travels between A and B in the least possible time. Fermat’s principle of least time led to one of the most important principles in modern physics – the principle of least action. Number theory was Fermat’s true love. He had a copy of Arithmetica – a book by the great Greek mathematician Diophantus. Arithmetica was published for the first time in (very approximately) the year 250 AD. This book inspired a great number of new ideas from Fermat. He would use Arithmetica much as a modern person might use a crossword puzzle or a game of Sudoku, and he would scribble ideas in the margin of the book. These ideas transformed number theory. Fermat had happily teased mathematicians in France and elsewhere with various theorems for decades. Little did he know that something he scribbled in the margin of his copy of Arithmetica would tease them for centuries. This tease became known as Fermat’s Last Theorem. If n=2, we have Pythagoras’s theorem, which has an infinite number of whole number solutions, the most famous example of which is the 3-4-5 triangle: x=3, y=4, z=5. 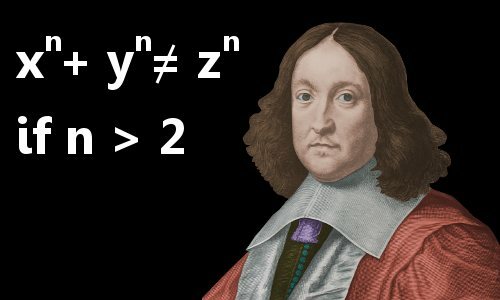 Fermat’s Last Theorem claims that if n is a whole number bigger than 2, the equation has no whole number solutions for x, y and z. Fermat himself left proof that he was correct for n=4. As a bonus, Fermat’s proof of his theorem for n=4 meant that only cases where n was an odd number were left to tackle. Fermat claimed to have proved it for all values of n, but famously said the margin of his book was too small to write his proof. Written in 1637, it wasn’t actually his last theorem, but nobody knew about it until his son found it five years after Fermat died. Years later, after all of Fermat’s other theorems had surrendered to mathematical proof, this remarkable theorem resisted all assaults. Since the theorem is easy to understand, many people, including great mathematicians such as Leonhard Euler and Lejeune Dirichlet, attempted in the decades and centuries following its publication to prove it. Nevertheless, the fascination continued to tantalize mathematicians through the ages until Andrew Wiles, a professor of mathematics at Princeton University, published his complete proof of the theorem in 1995. Until Wiles’s triumph, the problem had resisted all attempts to solve it for over 300 years. Pierre de Fermat died aged 57 or 58, on January 12, 1665 in Castres, France. The cause of his death is not known. Three days before his death, he had been carrying out legal business in the local courthouse. He was buried in the Church of St. Dominique in Castres. Images of Pierre de Fermat, Thomas Heath, Marin Mersenne, and Carl Friedrich Gauss enhanced and colorized by this website. “Pierre de Fermat.” Famous Scientists. famousscientists.org. 29 Dec. 2014. Web.